Careers in this sector are related to the humanities and performing, visual, literacy, and media arts. Careers in this area might include graphic, interior and fashion designers, writers, film producers, artists, actors, dancers, and musicians, journalists, media specialists, photographer, advertising executives, radio broadcaster and more. Are you a creative thinker, imaginative, innovative and original, like to communicate ideas, like to draw, play a musical instrument, take photos, or write stories? 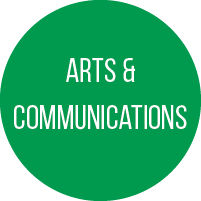 Take a look at the wide variety of career options in Arts & Communications at the MiCareerQuest Southwest event!